The full details of the 2019 Suzuki RM-Z250 have been released and it has a raft of upgrades from the current model, including a brand-new chassis and an uprated engine. Now in its twelth year of production, the MX2 machine (the second tier of motocross) takes inspiration from the Suzuki RM-Z450 and gets improved rigidity from a new frame and swingarm, and sharpened handling from a new rear shock and updated forks. 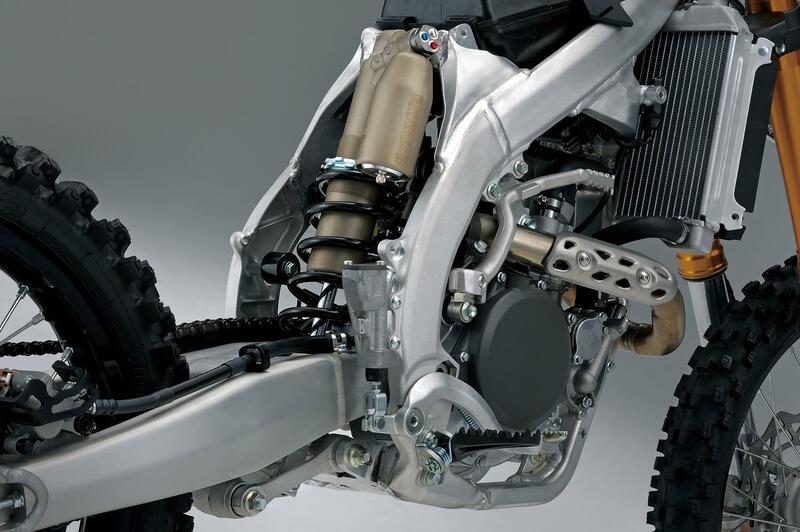 The changes to the RM-Z250’s engine are intended to give a 5% power increase across the rev range. Airflow has been improved by using a new cylinder head, intake and exhaust ports and a 30% larger air filter aperture. A second injector has been added nearer the airbox which improves the fuel/air mixture, and the main injector in the throttle body is angled upwards to hit the butterfly valve directly. All of this will mean improved fuelling and throttle response. 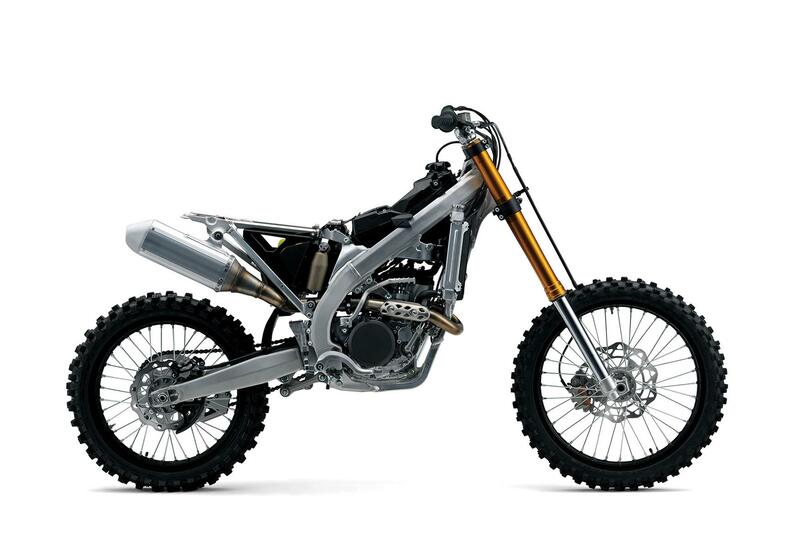 Weight reduction is the name of the game with the new and improved frame design. Suzuki’s engineers have managed to shave 370g off the weight of the last frame, while also increasing torsional rigidity by 10%. The improvements continue with the new hydroformed swingarm, which uses a tapered cross-section to retain rigidity despite weighing 80g less than the outgoing version. Changes to the bars, pegs and seat adjust the rider’s position on the bike, and make it easier for them to move around. KYB have supplied the fully adjustable suspension, but it’s all change here too. The air forks on the outgoing model make way for springs, and a MotoGP-derived thin wire diameter spring on the rear shock saves 370g. All of this new power and torque means the new RM-Z250 needs plenty of stopping power too, which comes courtesy of a new front brake with a bigger disc and enhanced grip from new Dunlop tyres. The front disc changes from a 250mm to a 270mm while new pads will also improve rider feel. 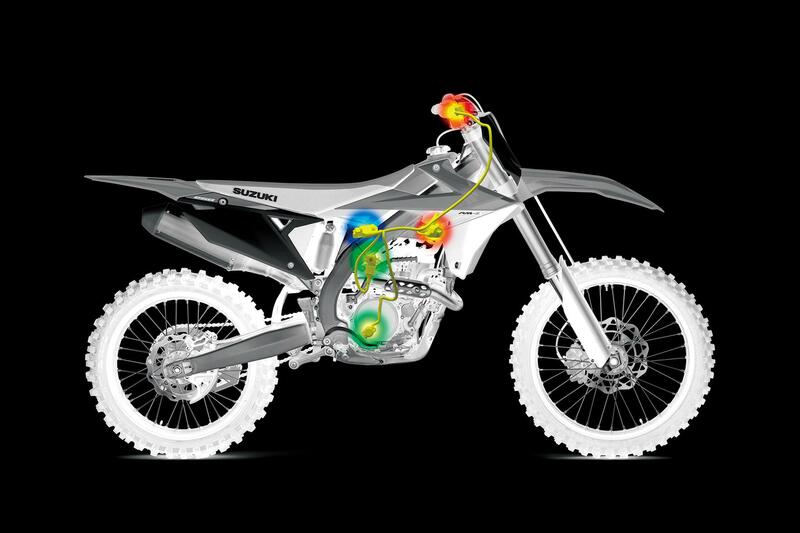 Suzuki Holeshot Assist Control (S-HAC) gives the rider two modes which either advance or retard ignition timing to get off the line quicker depending on the surface. In both modes, S-HAC deactivates and ignition is returned to normal timing after six seconds, when the rider shifts in fourth gear or when the throttle is closed. The traction control system differs to a road version in that it ignores rear wheel spin. The ECU monitors throttle position, engine speed and gear position and uses the information to adjust the ignition timing and fuel injection rate for maximum traction. ECU updates and the adoption of twin injectors on the 2019 model will mean improved traction control overall.